The Pittsburgh Steelers listed quarterback Ben Roethlisberger as probable for Sunday night’s AFC matchup with the Indianapolis Colts, and Pittsburgh’s offensive line remains healthy for the second straight week to protect an All-Pro passer who just suffered a concussion. But the same can’t be said for Colts projected quarterback Matt Hasselbeck, who will miss two starting offensive linemen against Pittsburgh’s No. 7-ranked pass rush. Indianapolis is expected to rework its starting offensive line for the fifth time this season, according to ESPN, as guard Hugh Thornton (elbow) and tackle Anthony Castonzo (knee) are both listed as out on the team’s official injury report. Neither practiced all week. Thornton, who made last week’s report but was probable with a knee injury, has appeared in 10 games and started nine this season. Castonzo has made 10 starts this season and will miss his second straight game. Fifth-year guard Lance Louis will stand in for Thornton, while Joe Reitz steps up for Castonzo. Making his fifth start in place of injured All-Pro Andrew Luck, the 40-year-old Hasselbeck hopes to lead Indianapolis to a fifth straight win with him under center. And while Hasselbeck’s dealt with the same patchwork fronline as Luck, taking 8.0 sacks and 30 additional hits over his four previous starts, the Colts can ill afford another injured quarterback as they cling to first in the AFC South. Indianapolis also ruled out rookie receiver Phillip Dorsett (ankle), linebacker Jerrell Freeman (hamstring), as well as Luck, who resumed throwing some this week but did not participate in practice at all and no official timetable’s been set for his return. For the second straight game Roethlisberger will have a healthy line protecting him, an excellent sign for a Pittsburgh unit that’s sent five players to season-ending injured reserve this year. The Colts pass rush, tied for No. 27 in the league with only 19.0 sacks, doesn’t necessarily present a formidable challenge to the Steelers pass-heavy attack, but the team has kept a close eye on Roethlisberger all week following his concussion and will continue to do so against Indianapolis. 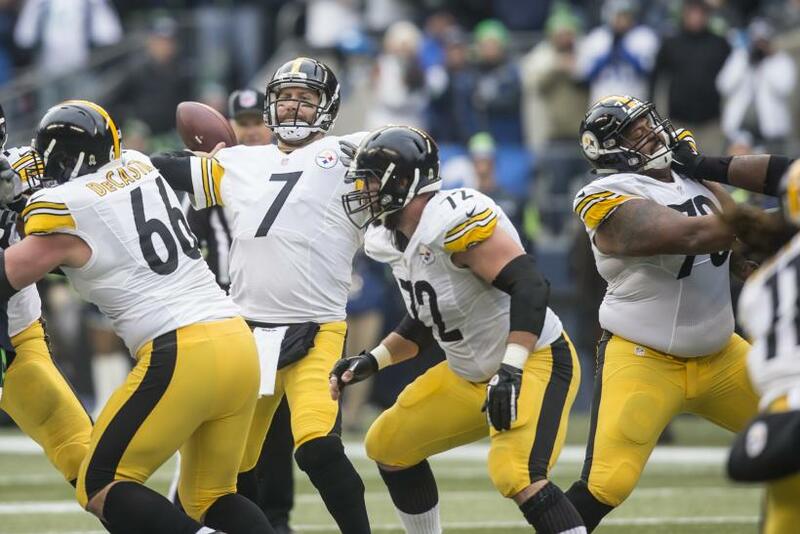 Roethlisberger took a helmet-to-helmet hit in Week 12 against Seattle, and was diagnosed with a concussion on Tuesday, but cleared a day later to practice. Otherwise the Steelers are mostly healthy with two exceptions. Tight end Heath Miller (rib) is questionable and could miss his first game of the season and first since 2013, while linebacker Sean Spence (hamstring) is out. Miller’s second on the team with 50 targets this season, hauling in 39 receptions for 390 yards and a touchdown. Spence has started four and appeared in all 11 of Pittsburgh’s games thus far, ranking ninth on the team with 34 total tackles.